Silver Bar Sizes | Which Weight of Silver Bar is Best? Although silver bars are all made from the same material, the size of bar you buy can have a drastic affect on your pricing over spot, resale ability, and storage concerns. This article was written to reveal the common sizes of silver bars as well as to recommend which size/weight of bar makes the most sense for which sort of investor. 1 oz silver bars are the smallest, and because of that, they typically carry the highest premium over spot price as it costs the mints the most in fabrication costs per ounce of any sized bar. 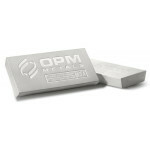 Read our full article about 1 oz silver bars here. 5 oz silver bars are the next smallest, but they actually carry roughly the same premiums as 1 oz bars because they are a bit less common than 1, 10, or 100 oz sizes. 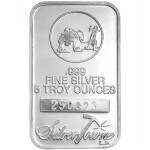 Learn more about this relative rarity at our full 5 oz silver bars page. 10 oz silver bars are some of the most widely traded on the market, and are produced by nearly every silver bar manufacturer out there. 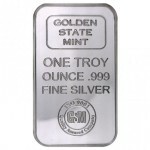 The premiums start to get more reasonable here, and you can learn more at our 10 oz silver bars page. 1 kg silver bars are more of a specialty bar, and aren’t produced by many of the major manufacturers. You will likely have to look long and far to find these, and because of that, you’ll usually pay an inflated price. Learn more about 1 kg silver bars here. The largest commonly traded form of silver bar is the 100 oz bar, which is about the largest bar that can be held comfortably in your hands (and that might even be pushing it). 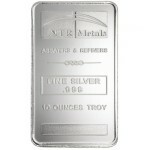 Nearly every provider produces 100 oz bars, and you can learn more about 100 oz silver bars here. Although the bar sizes above make up the majority of the physical silver bar market, there are other sizes out there like 1/2 oz, 2 oz, and 50 oz. 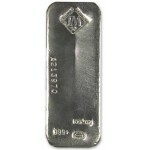 We discuss those in our miscellaneous silver bar sizes article. Which Size Bar is Right for Me? The most common question we receive when it comes to silver bar size is “what size silver bar should I buy?” There are a few factors that go into determining the optimal bar size, which we will discuss now. When investing in silver bullion, the most important key is to stay as close as possible to the spot price of silver itself. Any money you pay above and beyond the spot price is called the “premium over spot”, and as a retail investor, it’s nearly impossible to avoid this premium, so it makes sense to keep it as low as possible. The rule here is that typically, the larger bar you buy, the lesser the premium over spot. Mints have relatively static fabrication costs for most sized bars, so buying 100 oz bars always saves you money as compared to 100 1 oz bars. As long as divisibility isn’t a huge concern, we recommend buying a large of a bar as you can afford to avoid wasting too much money on fabrication premiums. 100 oz bars are just as liquid as 1 oz bars in the retail market, so you will never have a problem unloading larger bars and you’ll save a considerable amount of money. 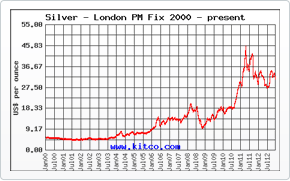 The other factor to consider is the storage of your silver bars. Again, in our opinion, the larger you buy, the easier they are to store. Three 100 oz bars can be stacked up in a safe much easier and more efficiently than trying to pile up 300 1 oz silver bars, so you typically are better off going with the larger bars whenever possible.